We would like to thank all of the loyal guests and visitors over the last 13 years who helped make the George Carroll House the warm and welcoming Bed & Breakfast it is. We also want to thank the Kidder family, especially Chris and Betsy, for their years of hard work and personal devotion to their guests and to this amazing 146-year old home. The George Carroll House is about to enter into a new chapter, under new ownership, and we would be thrilled if you join us on this journey! Please add “Victoria Inn” to your search favorites – the website will be up and running soon. The George Carroll website will be redirected to Victoria Inn “victoriainnerie.com”. We will be closed for renovation from August 26th through September 6th. Reservations will be available beginning September 7th. You will notice that all dates are now blacked out, but they will open very soon, and you will be able to make reservations. Until then, if you would like to call and put a room (or rooms) on hold, please feel free to call the new owners, Kevin and Vicke Marz – they can reached at 562-235-5968. We offer historic lodging accommodations in Erie's downtown business district. 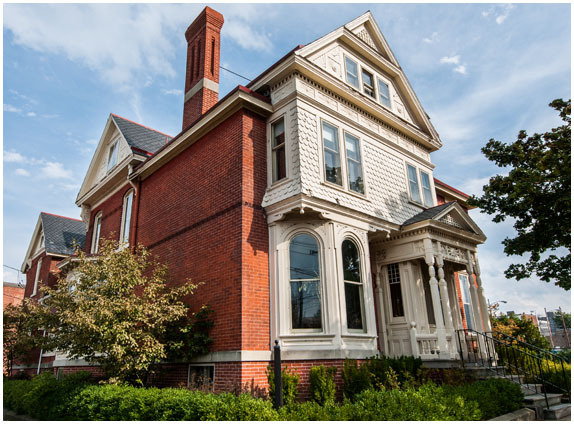 The Queen Anne style house was built in 1872 for George Carroll, an early settler and lumber dealer. All rooms have a private bath, cable television, free wireless internet, and air-conditioning. Free off-street parking for one vehicle per room is also included. We utilize a keypad entry system on our front entrance door and guest rooms. Guests can arrive any time after 3:00 PM and have immediate access to their room, day or night. Our front entrance door is located on Peach Street, while our parking is located off of West 4thStreet directly behind the house. The keypad code is selected by each guest and removed after departure. A full breakfast is included in the room cost. Available 8 a.m. – 10 a.m. in the dining room. There are many changes coming, all designed to enhance your experience at our beloved Bed and Breakfast! All rooms are located on the second floor with no elevator. We do not accommodate children under the age of 12.